Dubai, UAE, May 10, 2018: This year, the GUESS Ramadan collection is an ode to femininity, style and glamour. Targeted specifically to Middle Eastern customers, the pieces have been designed with high attention to detail and delicate finishes, offering a selection of glamourous outfits for daytime and eveningwear. Long button-down dresses, flowing skirts and classic kaftans are enriched with striking floral patterns and bold animal prints, across a striking colour palette of deep ocean blues, bright honey yellows and earthy warm browns. Captivating styles including co-ordinates are also new to the collection, adding a fun and modernised twist for the season. The delivery exudes femininity with rich golds, soft nudes, navy and creams featuring across stunning flowing maxis and draped chiffon tops, adding a graceful touch of romanticism to the collection. Gold accessories have been added to striking full length dresses, creating exciting and stylish looks for those special occasions and moments shared during Ramadan. The GUESS kids Ramadan collection provides girls ample opportunity to shine with intricate lace detailing, subtle sequins and bright floral patterns coming in an array of soft pastel hues. Each silhouette is complimented perfectly with a mixture of handbags and head bands, finished off beautifully with rhinestones and roses. 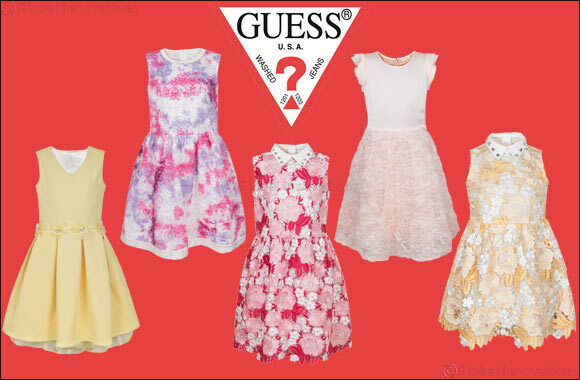 The exclusive collection will be available from beginning of May in all GUESS stores across the Middle East.